Welcome to Wayback Wednesday, your midweek blast from the past! This is a feature where we look back on yesteryear, digging into the archives to indulge in some nostalgia, and in some cases, wonder just what we were thinking. Check in every Wednesday for features and retrospectives on older versions of NBA Live, NBA 2K, and other basketball video games, as well as old NLSC editorials re-published with added commentary, reflections on big announcements from years gone by, and other flashback content. The relocation of the Seattle SuperSonics to Oklahoma City and their subsequent re-branding to the Thunder happened quite quickly during the offseason of 2008. On top of outrage and contempt, not only from Sonics fans but a lot of NBA fans in general, the rushed move also resulted in logos and jerseys that most people didn’t particularly care for. Disdain and animosity towards the Oklahoma City Thunder seemingly persists to this day, even after the team lost to the Miami Heat in the 2012 NBA Finals. 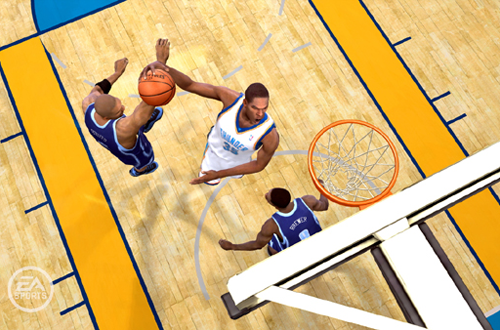 As you might imagine, the hectic relocation led to a late reveal of the Thunder’s designs, which ultimately had an impact on NBA Live 09. Because the official unveiling happened so late in the production cycle of NBA Live 09, EA Sports were forced to use placeholder branding for the Thunder, rather than their real logos, jerseys, and colours…at least initially. In the intro video for the PlayStation 3 and Xbox 360 version of NBA Live 09, there’s even a clip of Kevin Durant wearing a Seattle SuperSonics jersey. For the record, the Oklahoma City Thunder officially unveiled their new name, logos, and colours on September 3rd 2008, while the jerseys were revealed on September 29th. Although NBA Live 09 was released in early October, at launch the team was called the “Oklahoma City Team”. As mentioned above, they were using the placeholder logos that they had had during the summer league, along with some generic black and white jerseys. What’s interesting about the situation is that EA Sports and 2K Sports are generally given a heads up on any new branding for NBA teams, receiving those new designs well in advance of NBA Live and NBA 2K going gold, so that they can be included in the game. Of course, just as previews often spoil the reveal of features and bonus content – such as the new historical teams in NBA 2K16 – so too do new logos and jerseys get leaked in early screenshots and videos. In fact, the designs for the Oklahoma City Thunder were leaked via early footage of NBA 2K9, and a screenshot of NBA Live 09 on NBA.com. Of course, NBA Live 09 would have gone gold well before the leak of the jersey design via that screenshot, though it would appear that none of the Thunder’s branding was made available to EA Sports in time for it to be in the game out of the box. Again, this resulted in NBA Live 09 running with the temporary logos and jerseys that the Thunder used at the 2008 Draft and during summer league play, as the relocation was being organised and before the official unveiling of their new designs. It was an unfortunate situation as far as authenticity was concerned, but an understandable by-product of the rushed relocation process, which had been delayed by lawsuits. However, the leaked NBA Live 09 screenshot did prove that EA Sports had correct, updated art assets in place for the Oklahoma City Thunder by late September. EA confirmed that they would be releasing free downloadable content that would add the Thunder to the PlayStation 3 and Xbox 360 versions of NBA Live 09, with their proper name and branding. The pack was available around the launch of the game, so PS3 and 360 users didn’t have to deal with the placeholder logos for too long if they didn’t want to. Commentary referencing the Thunder’s new name had also been recorded, and was included in the DLC. Unfortunately, there was nothing that could be done with the PlayStation 2 version of NBA Live 09. 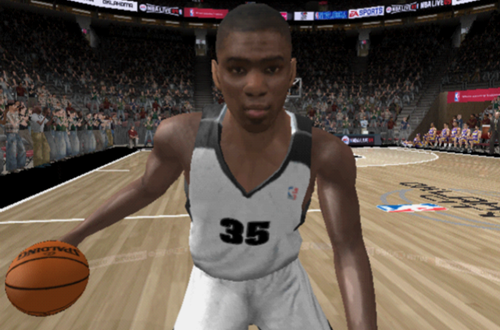 With no means of updating the game through downloadable content, nor the possibility of unofficial community-made updates as with the PC versions of previous releases, the PS2 version of NBA Live 09 was stuck with the summer league logos and generic jerseys. Needless to say, that was obviously a disappointment for anyone who desired authenticity and accuracy in terms of team branding. On the other hand, if you didn’t care for the Thunder’s moniker or their new logos, it was potentially a blessing in disguise. In NBA Live 09 on PS2, you could play with an Oklahoma City team that theoretically had whatever name you cared to imagine for it. The logos and jerseys obviously weren’t anything special, but in that respect, they readily lent themselves to any nickname other than the Thunder. Alternatively, you could still think of them as the Thunder, with a darker colour scheme. It was one way to make the best of the situation. Such a thing has never happened before in an NBA game, and it probably won’t happen again anytime soon. The Seattle SuperSonics’ relocation and transition into the Oklahoma City Thunder was anything but smooth, giving video game developers little time to properly account for it. It’s a situation that I’m sure the league would like to avoid for many reasons, and to that end, EA Sports and 2K Sports will probably continue to get plenty of advance notice about new designs they need to include. Of course, even when they don’t, patching that kind of content into the games is certainly feasible these days. NBA Live 09 is a significant game for a few reasons. It was the first NBA Live game to make use of EA’s partnership with Synergy Sports Technology. The Xbox 360 and PlayStation 3 version had a single game version of Be a Pro, whereas the PlayStation 2 version boasted a primitive version of a full career mode. It was the first NBA Live game to be a console-only release since NBA Live 2002, a trend that has unfortunately continued to this day. On a more positive note, it also saw the debut of the NBA Live Academy, and practice drills in Dynasty Mode. On top of all that, it had to account for one of the most controversial and hectic relocations that the NBA has ever seen. The way that the relocation was handled as far as in-game assets are concerned also demonstrated the changing times in terms of adding content and fixing issues post-release. As I mentioned in a previous article, the need for day one patches and subsequent fixes is understandably a contentious one in gaming circles. However, the ability to make those changes when needed is definitely a welcome improvement over the old days, and certainly addressed a key issue with authenticity in NBA Live 09. Unless of course, you were on PS2…or preferred to imagine a different reality. I’m gonna fire up my PS2 now and play with the “Oklahoma City Team”.